Ebola is the common term for a group of viruses belonging to genus Ebolavirus, family Filoviridae, which cause Ebola hemorrhagic fever. The disease can be deadly and encompasses a range of symptoms, usually including vomiting, diarrhea, general body pain, internal and external bleeding, and fever. Mortality rates are generally high, ranging from 50% to 90%, with the cause of death usually due to shock or multiple organ failure. Lifeboat Foundation responds to largest Ebola outbreak in history. October 1, 2014 — The Lifeboat Foundation has raised our GETAS alert level from Guarded to Elevated. Especially alarming to infectious disease experts was that the first patient to be diagnosed with Ebola in a USA hospital was evaluated initially and turned away, a critical missed opportunity that could result in others being exposed to the deadly virus. On the second visit two days later, Ebola patient Thomas Eric Duncan arrived by ambulance, potentially putting at risk the emergency responders who transported the patient. Even then, the hospital refused to put Mr. Duncan in isolation even when one of his relatives told them that Mr. Duncan probably had Ebola. Finally that relative had to call the Centers for Disease Control and Prevention and the Department of Health who then forced the hospital to put him in isolation. While countries such as Saudi Arabia, South Africa, and Kenya are restricting travel to Ebola-plagued nations, the United States is so far not implementing such restrictions. 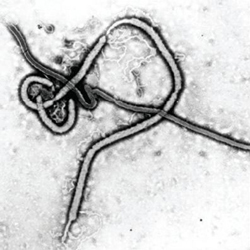 Saudi Arabia's restrictions are especially helpful as about two million pilgrims go to Mecca for the Hajj there each year and Ebola could easily spread among those huge crowds. To improve Lifeboat Foundation's ability to evaluate existential threats, Guardian Award winner Lord Martin Rees, author of Our Final Hour: A Scientist’s Warning, has now joined the Lifeboat Foundation Policy Board. His other awards include the Gold Medal of the Royal Astronomical Society, the Balzan International Prize, the Bruce Medal of the Astronomical Society of the Pacific, the Heineman Prize for Astrophysics (AAS/AIP), the Bower Award for Science of the Franklin Institute, the Cosmology Prize of the Peter Gruber Foundation, the Einstein Award of the World Cultural Council, the Crafoord Prize (Royal Swedish Academy), the Templeton Prize, and the Isaac Newton Medal. Martin holds the honorary title of Astronomer Royal and has received honorary degrees from a number of universities including Sussex, Uppsala, Toronto, Durham, Oxford, London, Yale, Greenwich, Melbourne, and Sydney.